These are lovely! Brilliant colors. The design stands out well. I have been eyeing both patterns and the yarn...now i'm convinced! Now to choose the color. These will be for me! Oh my, I love those! Thanks for these... it inspires me to make some for myself! What a deal! These are so pretty. Oh, now I'm drooling. Yarn, patterns... love it! Oh That's great to know. When I make my next order from WEBS, I'll sure get one skein of Pashmina! Thanks for letting us know. Incredible! I'm in love with every color I've seen so far. Can't wait to try making a pair. Just gorgeous. Oooh! I don't know which sample I love more! Lovely, can't wait to try it for myself! 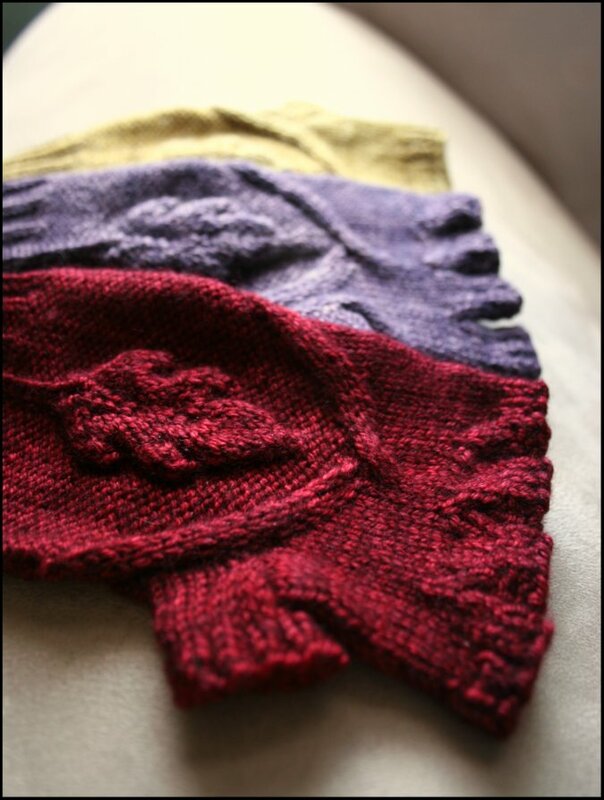 Or for 1 skein, you could make them full mittens? These are lovely!! Have just finished a spring tee for my daughter...what next? Have you heard about the floods here in Australia? Come and check them out. Kx. Wonderful! I've got lots of pashmina in my stash! Really pretty and they look like a lot of fun to knit! Today I bought your "Autumn Vines Beret" pattern online. When I tried to print it in the Adobe format the print was blurry. This happens a lot with Adobe. Also, I have no desire to print the information pages with all those extra pictures which look pretty but are not necessary for me. Is there any way I can copy and paste it in unformatted text? If you provide me with your email address, Ill be happy to send you the text version.